Yesterday, the news came down the Mojo wire, Dindo Capello has retired from driving prototypes, no more would he be teamed up with Tom Kristensen and Allan McNish for Audi. A bittersweet moment, as the charming Italian is rightly one the most popular guys in the paddock and as his record shows a driver of genuine talent and accomplishment. Anyone who witnessed his final stints at Laguna Seca or Road Atlanta in 2007 would attest to that fact. A couple of years back I interviewed Dindo, along with his fellow Musketeers, TK and Nishy. The results were published elsewhere, but I think the piece is worth re-running as a tribute to an all round Good Bloke. Sometimes, on a day like today, I look back and reflect, that all things considered, I have had a fortunate life. Auditing, Accounting, Advertising, Design and Motorsport have paid the bills somehow. They have largely kept me out of mischief and taken me to some far flung places and events that I would otherwise have missed. More importantly these occupations have introduced me to some pretty strange and interesting people along the way, some were scoundrels and wastrels but there was never a dull moment in their company. Others were in the genius class, Fangio and Senna, for instance, though I was never more than a passing face in the crowd to them. My final career change to photography and writing took place back in the middle of 1997. That year Le Mans was supposed to be dominated by the ranks of the FIA GT Championship, the GT1 supercars. Indeed the factory Porsche 911 GT1 could, and should, have won the race but an accident caused by mechanical failure robbed Bob Wollek of a chance to triumph at the event he prized above all others. Then while cruising towards the Chequered Flag the other 911 GT1, with Ralf Kelleners at the wheel, caught fire. That left the Joest prototype to grab a second win. It was crewed by veterans Michele Alboreto and Stefan Johansson, plus a young guy who I had barely heard of and did not pay much attention to. Big Mistake. JB: What first sparked your interest in motorsport? TK: I was born in a gas station and my Dad was a racing driver, so I think it came quite naturally. AM: My father was involved with David Leslie, who was racing in Formula Ford at the time and he was from Dumfries. So as a six year old I went along with my Dad who was his mechanic. I went to a very cold, wet Oulton Park and places like that. I suppose that’s where it all kicked off. DC: For me, more or less the same like Tom, the only difference is that my Father was not a racing driver but he had a really great passion for motorsport. On the wall of his office there were pictures of Jackie Stewart…. DC: Yes, for sure Pirro. JB: How did you get started in racing? AM: I had a motorbike, because as much as my Dad liked four wheels, two wheels was probably his real passion and I had a little motor-cross bike. I not very big now, I was very, very, very small then. When I went to the ATCC class my feet didn’t even touch the pegs, never mind the ground so Mum put a stop to that, so then four wheels took over from two. TK: It started at my Father’s gas station, I was travelling with my Father to the race tracks but I got a go- kart when I was 9. I drove it around the gas station between the cars coming in for fuel, so it was a bit dangerous. Then I was taken to a little go-kart track in Northern Jutland, it all started from there. Nice summer evenings. AM: You’re lucky, you had summer evenings, I was in Scotland. DC: I started by chance, it was my birthday, it was my 11th Birthday and as a present my parents took me to the go-kart track which was opened just a few weeks, near to my home town. From that day, for the next 5 or 6 years, every weekend I was at that place. AM: Was that your 21st? TK: There were go-karts back then? JB: Did you ambitions to become a professional, to be a star? AM: Not really for me. I didn’t. OK I watched television and saw Grand Prix and was interested in racing but I never had any thoughts that it could turn out to be what it actually turned out to be. It was a happy coincidence more than anything else. TK: I think there was a love of being in racing. I absolutely loved the karting scene and the people I raced against in those days, like Mika Hakkinen, went on to race in single seaters at that time and I followed a few years after. Financially, coming from Denmark, it was always an uphill struggle. It was more the thing that you just developed over the years but always from the perspective of passion, of loving being on the track and being part of a nice, respected friendship, especially at the karting track. It has developed into something that I am very, very grateful for. DC: For me I was 6, 7 or 8, it was a dream, like when you ask a little child what would you like to do? They say a doctor or football player, I would have said car driver but at that time I didn’t know anything about that. I was already reading Autosprint. What I remember, and I still have it at home, was that there was an article about Ricardo Patrese, Elio de Angelis and another driver, they were still in Formula Italia or Formula Three. There was a big article, the title was “Is there a future in Formula One for these guys” and I remember I took this paper and put my picture on the article and I stuck it on my wall. I was 8 or 9 years old. It was really just a dream. I didn’t even know about go-karts. JB: Any advice for Youngster who wants to go into racing or some sort of motorised competition? AM: Enjoy it! That is the principal thing is enjoy what you are doing. The one thing I have noticed here about the answers to that last question was that pretty much every one of us did not say that they had a career plan to be a racing driver. It was something that came from enjoying what they were doing. That is a definite key, Too many young drivers try to have this big career plan from the age of 10. TK: Listen to your stomach and never say no. Take all the experience you can get, if you get a chance to drive in whatever sort of car do, take it in and it gives you experience. It will help you develop as a driver. DC: All I can say is the remember that there more than just Formula One. That is one of the biggest mistakes that a young driver can make, to try to reach Formula One and forget all the rest. In Formula One there are 20 places and it means if you want to be a professional and if you love this kind of sport you have to think of other categories. Formula One is the dream of everybody but just very few can reach it. Some drivers, I know of so many Italian drivers who were very, very good in Formula Three or even in F3000, only try and reach Formula One. Suddenly they could not make it and they disappear from our world. That is very sad, I think. JB: During your developing years any particular heroes and why they mattered to you?AM: You…………..
AM: For me the person I followed when I was young, he and his Father started me in karting and then again started me in Formula Ford, was David Leslie. So on that side of things, I suppose he was a bit of a hero because I followed what he was doing all the time. Of course you want to spray the Champagne like Senna did, when he won Monaco so many times, and the World Championships against Prost, which was our era. But in the real world my hero would be David. TK: I remember my Dad was a racing driver and I was pretty proud of him to be honest. I remember that I liked the versatility of guys like Mario Andretti and Jacky Ickx who have done different things successfully, I like that. Mario Andretti, I took a picture of him when I was 9 years old at Anderstorp, the first time I was at Formula One race and he came back into the paddock after retiring, with Colin Chapman, who had his arm around his shoulder. He had retired from the lead which gave the victory to this Brabham, the Fan Car. That picture I took, I shot it myself, probably I could have been a very good photographer. It is the greatest picture that I ever took, Mario looked like my Dad when he was young. There is a lot of these things that go into the mind of a young boy of that age. Mario has since signed that picture. DC: For me I had respect for so many drivers but I never really had a hero. The only one I really remember was Ronnie Peterson because he had a driving style that I liked a lot. Then after it was Michele (Alboreto) because I remember his career. Just before I jumped into a Formula Fiat Abarth I was in Milano talking with a guy who gave me some advice as I did not know much about motorsport. Then Michele was just walking up to the same office, coming from his first test in Formula One. I remember I met him on the stairs and for me he was like a hero. I knew he had no money, nothing but he reached Formula One. At that moment Michele was the driver to follow, what he had achieved was just due to his talent, not due to other factors. Later, many years later, we were team mates and that was really something special for me. JB: When I was planning this interview I did not realise that I would also have the pleasure of Dindo’s company, an unexpected treat, so I wanted to ask a couple of questions about Formula One for Tom and Allan. TK, I know that you were a test driver for Tyrrell and Michelin. How do you feel about the fact that you never actually raced in Formula One? Do you think you missed something? TK: As we mentioned before it is the dream and becomes an ambition along the way, it is not how it starts out, but Formula One is the place where you want to go. That is for sure, but without that ambition the rest cannot follow but I think, today, I have been privileged to have the career that I have had, which has been open to every form of racing. In a way I can say I am also thankful that I didn’t get the chance to get into Formula One at some stages because it has meant that I have been able to, first of all stay with sportscars for many years, particularly being with Audi. The right situation (in F1) probably would not have arisen for me. I have had tests with Williams, Minardi, BAR-Tyrrell and then the Michelin test driving a Jaguar. The tests were a great experience, I am sure I would have been happy to have been in Formula One if it had happened but obviously then I would not have had the career as long in sportscars as I have had. As Dindo said, the racing in sportscars is better and it is what I ultimately enjoy, it is probably not marketed as well as it should be but it is a community I love to be in. I have tried other series along in my career but you notice and benefit from the sharing with other drivers, that is really great. Sharing a race car at the highest levels, is quite special. JB: Allan, you had two bites of the cherry. You were a test driver for Benetton. AM: McLaren for three years and then Benetton. JB: Yes, and then you broke from convention. You went from single seaters to sportscars and then back to Formula One. You got a ride with Toyota in their first year. How did you feel about that? I found a quote from Martin Brundle saying “replacing Salo and McNish with Panis and AN Other was not in my view, a step forward.” when it was announced that you were not going to be retained for a second season by Toyota. AM: Martin is a genius. He knows everything. The first time around as a young driver coming through I had a lot of miles with McLaren and also with Benetton, so I suppose it formed me to be what I became. The sportscar route was taken for a very simple reason, there was no F1 seat available to me at that time. You realise that you have to do something, you can’t sit at home. The oddity is that it led me back to Formula One in a situation I did not think could arise or would arise. That was quite a fortunate situation but it was also unfortunate. It was Toyota’s first year, it was my chance and you’ve got to grab it, but it didn’t quite work out the way that everybody hoped it would. It was not really a surprise, a new team in Formula One struggles to find success that they want or wish for. It was a clear cut case from my point of view when I went to Renault the following year as a test driver. My first lap in the Renault was quicker than my qualifying lap in the Toyota at Barcelona. My first ever lap was better, there was a world apart between the front of the grid and the back. So that was where I realised if you are going to be in it, you have to be able to win it. If you can’t be in it to win it, why are you there? I am a racing driver who wants to win races, so that was my reason to look at what ultimately is a better option for me. Having the chance to spray the Champagne at races like this or Le Mans with Audi. JB: OK, you guys have been rated as being at the top of the business of racing sportscars in endurance racing in the past 10 or 15 years. JB: It’s also true. Any one race or stint that stands out for you. Anything you think Wow!, that was great, I performed to the maximum today? AM: From my point of view, there’s a few that stand out. The one which, I suppose, was key was at Laguna Seca back in 1997 with the factory Porsche. 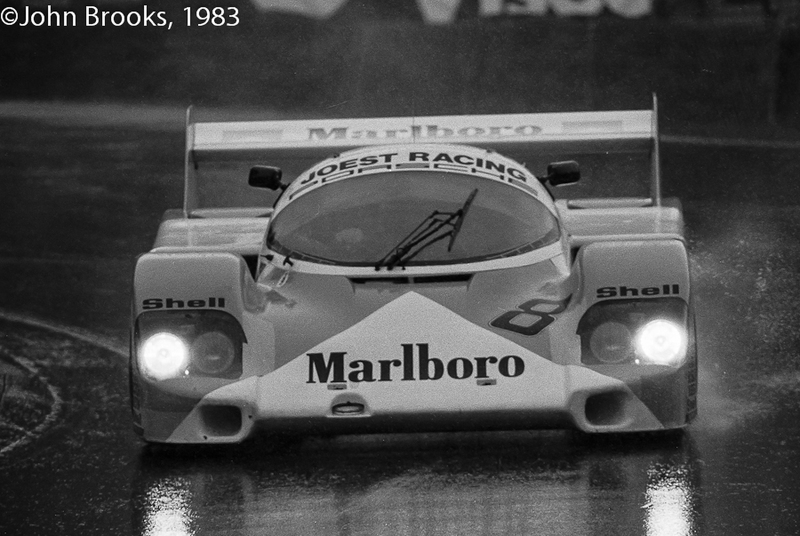 They had not won a race that year, so I was in the third car with Ralf Kelleners. We had a problem in Qualifying, so I only got one lap in Qualifying and was fourth. I managed to grab the lead by the second corner and led for the first stint. I think that opened up a lot of peoples’ eyes to the fact that I could still drive. I think that was key. 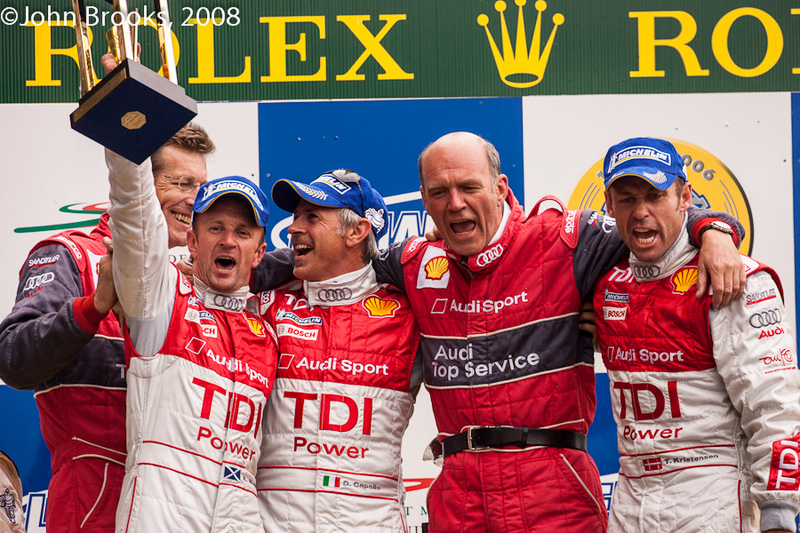 TK: It is always difficult to pick one but…………the first Le Mans I joined Michele as a team mate. I arrived after the deal was done, just three days before Qualifying. That whole experience of having an ambition that I would love to race at Le Mans once, then doing it a few days after with Michele and Stefan (Johansson). Then after the race we, I have won and I have a lap record too. This over one week was too much to take in, so that stands out in many ways. There have been a lot of things and every year you have highlights and things that really worked well. With Allan the race for me was 2005 at Sebring, where the two Champion cars were battling it out all race and finished a few seconds apart. This was also one to remember. 2001 in the rain at Le Mans. There is a lot of things that you can remember, you can go on and on. There was the race that we talked about just the other day, Mid Ohio. We only stopped once for refuelling in our Audi, it was fantastic. It was not necessarily planned, we were forced to do it but we managed to stop only once in the race of two hours 45 minutes. For the FSI engine that was amazing. DC: For me it is difficult to pick out some stints. I think every time we get in the car we give our best, there are stints where you look better than other stints. Because sometimes there are circumstances that makes you look better or worse than the stint before or after but every time you are in the car you give everything that you have, especially when you have to catch up or pull away from your competitors. If I have to remember than the end of 2007 when we won by 3/10s in front of the Porsche, once at Laguna Seca, once was here at Atlanta. That was, for sure, for the spectators something great. The first Le Mans win, with Bentley. For the first time Tom and I drove four stints in a row, that was some achievement. TK: It was also key to winning, which few people would have focussed on. 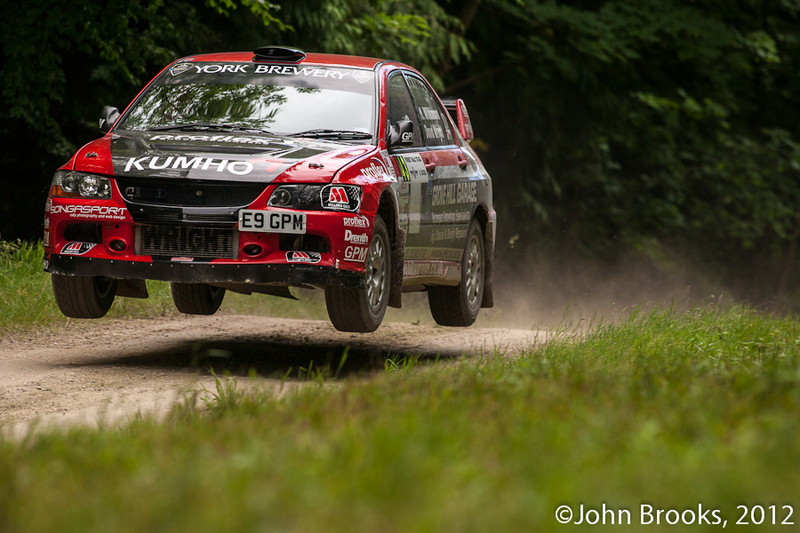 No one believed we could do that on the narrow tyres, that would have more chance of overheating. DC: For me as well I also remember the pole position at Mosport in 2008. It has the highest average lap speed in the ALMS season. JB: You are all just over 40, just? What is the secret of your durability and in particular when you have a season like 2009 or 2010 where you have a reduced programme of races? How do you keep sharp, in regards to race craft and traffic management? TK: Botox, Viagra and TDi! AM: Speak for yourself, I never use Botox. JB: I doubt that will get past the auto-censor. DC: For me and I think it is the same for my team mates. Even though we have had a long career and I think the results we have achieved in our career are not too bad. I think all of us work like it is our first season. We still have to show our performance and we are not resting on out laurels. That is the key, so always being in a very good shape, working hard not to lose fitness through age. If you consider our average age, our speed, our performance is uncommon. It is not easy to achieve this. There are older drivers than us, but they are not fighting to win and are not producing the same performance. The only word I can say is, work. It is hard to keep the level. AM: The only thing I would add is that it is easy to see after a race weekend that has not gone well, the faces in the de-brief show that we still have got the big desire to win. That produces everything else. JB: I was chewing the fat last night with my Californian counterpart, Kerry Morse, he’s like Felix Leiter and I am a bit like James Bond really. (Much laughter from the trio!) When I told him about this interview one of the questions that occurred to us was to ask Tom and Allan how they are going to support Dindo’s title challenge in the Le Mans Intercontinental Challenge? He finished at Silverstone so he is team leader now. AM: Can I just say that Capello after a brief affair with a German, when he had a weekend in the UK, has come back with his tail between his legs and we have taken him back in. TK: Is there a driver’s championship? AM: No, there’s no driver’s championship. JB: OK that question is down the Swannee. TK: We make sure we keep him out of the car for the whole race………that’s it. AM: That’s why you’ll find him wondering about the shopping mall on Saturday. JB: So that’s why he has shorts on and you two are dressed corporately. AM: His flight is booked for tomorrow. DC: This is why I ask to start the race. JB: OK,back to business. Do you have ambitions to continue in motorsport after you retire? Perhaps management of teams or drivers? TK: When you have been in motorsport the time that we have, there will be some involvement. Press department is highest on the list. JB: An Ambassador for the Press Department? TK: Chauffeur for Press Department. AM: Tom is right, I have been involved in motorsport for 30 years in one form or another, so I wouldn’t say my formal education outside the world of motorsport is very high, I’m probably not capable of doing anything else. But it’s your life and it’s what makes you get up in the morning. That is a critical point for me, it is what actually makes me get up in the morning, that buzz and feeling of it all. You might stop racing but you never stop having that feeling in your veins. DC: Like Allan and Tom, it is the same. However as we have talked many times once we stop racing, we stop racing. What I do not like is to see old and famous drivers go to the race track and drive a very slow car, finishing last just to be still driving. That is something that I would not like to do. TK: Maybe nobody would ask you……..
DC: Maybe do something for fun but not in a serious race. JB: How do approach a race like Petit Le Mans? Physically and mentally? You have a training regime but as a trio do you work on a plan, with your engineers, do you work with each other? AM: The last two years have been a bit different to normal. Normally you are racing all the time. Next season will be back to that but apart from Silverstone it has been a wee while since Le Mans. So you do have to do a bit of extra preparation but usually it is just a continuation of everything else. I would say that for PLM we arrived all on the same flight, we spend our time together and through that you build up the process of what you are going to be doing over the weekend and how you are going to do it. TK: Yes that is correct, we are done in terms of physical preparation, we are running and exercising every day. We are always talking about different aspects, it could be the car, the weekend, other competitors. JB: What do you do to relax between races? Something that helps to get your mind away from the tracks. AM: I’m not good at it. I’m not good at relaxing and things become an extension of a race weekend. However with two kids you have to switch off. TK: You have to also be honest with the people at home. Of course we have two families, the racing family, the Audi family and then there is the family at home as well. It is a contrast but it is also a support. It is important to relax, but it is difficult. You take the race home, the good races are easier to take home, than the bad ones. It is important to get away, sport is key for that. To get the body and the mind to re-generate. DC: Once I am back home normal life should be enough but I’m a little bit with Allan. I struggle to find the time to relax. In that area Tom is much better than us, he is able to share his time in a better way. That is something I would really like to learn from him. I struggle to relax because my mind is too much in this business and even when there is no need I find it hard. JB: Dindo, I saw a TV programme about your home life, a Michelin programme and your life seemed to consist of cruising on to the local café bar and drinking cappuccino, saying hello to all the women in the town, etc. DC: Actually I live in the country, in a small village, where there is no stress at all. That is why I think that I am the problem, because the stress I have, I provoke it myself. TK: So when the R8 goes boom through the town, it is that Mr Capello is home…..
JB: A final question for Tom and Dindo. I f you believe what you read on the internet Allan has the reputation of being a fan of a Scottish Football team, known as Queen of the South. Do you follow any similarly doomed, Biblically referenced teams or sports? AM: Can I just say that they are from Dumfries, which is my home town, for goodness sake, they play at Palmerston Park, the Mecca of Scottish Football. TK: OK. Are they part of the Women’s’ Soccer League of Scotland? For me it is my local town that is progressing as a soccer team in Denmark, so that is similar. But I suppose I have always been supporting Liverpool, since I was kid because of their fighting spirit. AM: You mean fighting on the pitch? Off the pitch? Both? TK: I like their attitude when going into a game. JB: It does not have to be football. Queen of the South have never been a glamorous club or particularly successful. AM: Queen of the South not particularly successful??? Two years ago they were nearly in Europe, they actually finished second in the Scottish Cup. JB: Didn’t they play a game in Denmark and lose? TK: Maybe we should talk about something we have all heard about…. AM: You haven’t heard of Queen of the South? You’re joking? TK: For me Queen of the South is Jennifer Lopez. JB: I believe the reference is to the Queen of Sheba in both Matthew and Mark or perhaps Luke in the Bible. AM: I am shocked that you have taken our greatest National football team and pointed them up to some sort of mockery. Do you know how the name started? It is obviously the region, it is the South of Scotland. They have an event called the Ride of the Marches, with the horns and the horses and everything, they ride around. Then on the Saturday Afternoon in May, I think, they have the Riding of the Marches through the town (Dumfries), they have a big market and then they crown the Queen of the South, a young lady from the region. It is an important local event. JB: You learn something every day. Thanks guys. This entry was posted in Notes from the Cellar, Real Men and tagged Allan McNish, Dindo Capello, Tom Kristensen on July 24, 2012 by John Brooks. 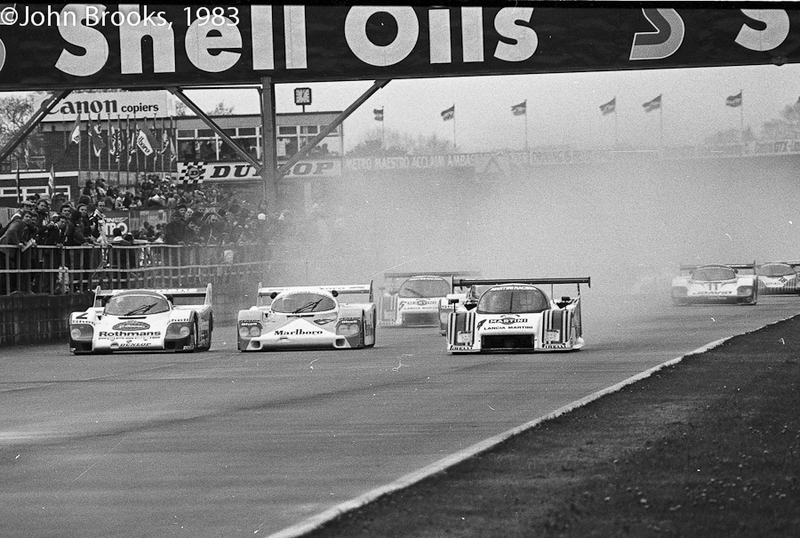 Folks have rightly been enthusiastic about the Group C race at this year’s Silverstone Classic. Back in the day it was pretty impressive too…………….. This entry was posted in Cool Stuff, Nostalgia, Notes from the Cellar, The Blink of An Eye and tagged Lancia LC2, Porsche 956, Silverstone on July 22, 2012 by John Brooks. Ok men, we have a Jumper! This entry was posted in Notes from the Cellar, The Blink of An Eye and tagged Festival of Speed, Goodwood on July 1, 2012 by John Brooks.